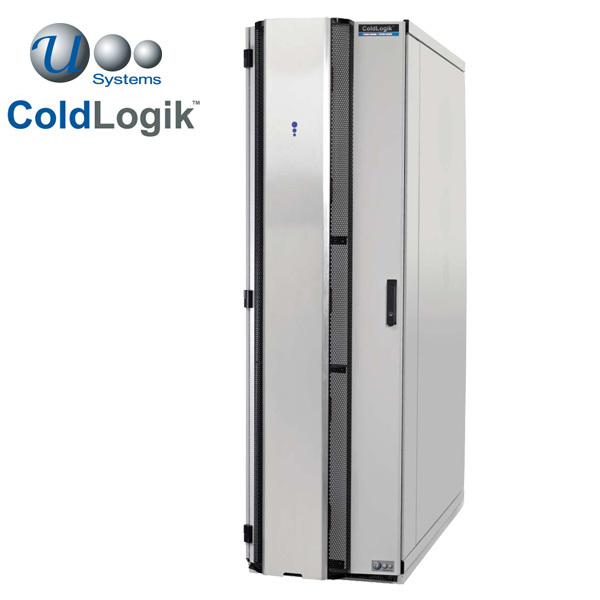 ColdLogik™ is a water cooled server rack solution that replaces the traditional approach to data centre cooling. ColdLogik™ water cooled server racks can cool loads of up to 45kW per rack, without the real estate problems inherent with hot aisle cold aisle and aisle containment designs. The waste heat generated by the installed equipment is removed at source by water cooling, without the risk of leakage in the data centre by utilising the leak prevention system. The ColdLogik™ water cooled server rack solution allows cooling water temperatures to rise from the traditional 6°C to between 14ºC and 21°C; reducing chiller size, energy costs and increasing the availability of energy efficient ‘free cooling’. The ColdLogik™ Management System ‘CMS’ allows the doors to operate individually or as a system to maintain the room at the correct temperature even with external heat loads and eliminates the risk of condensation. The ColdLogik™ CL20 rear coolers are fitted to the back of a 19″ enclosure, typically being IEC 297 3 and EIA STD 310 compliant. 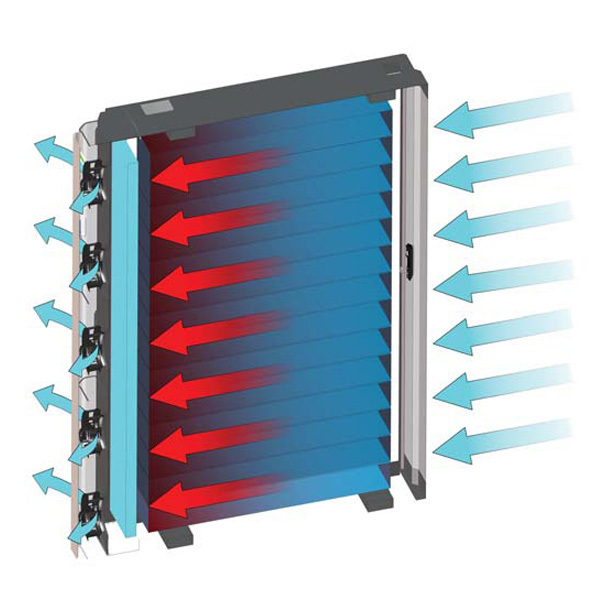 The coolers have been designed to remove heat generated by the installed equipment directly at the source so preventing hot exhaust air from entering into the room, creating optimum thermal and energy performance. Ambient air is pulled into the water cooled rack via the active equipment fans. The hot exhaust air produced by the active equipment passes over the heat exchanger matrix either by its own velocity or pulled through by the EC centrifugal fans mounted within the door; heat is transferred and rejected to the coolant. The resulting chilled air then passes back into the room at the predetermined room ambient temperature. The patent pending Leak Prevention System ‘LPS’ works by putting the data centre loop including the rear coolers on a negative pressure circuit. In the unlikely event of a coupling becoming loose or if a hole was drilled into a pipe, air would be pulled into the gap / hole, there by preventing water from escaping. The resulting air in the system is drawn through to a tank where it is then vented out of the system. Inline sensors detect a pressure drop and provide a warning alert to the user of the problem. The ColdLogik™ LPS can be retrofitted to an existing circuit and its modular design makes it scalable, so the system can grow as your data centre expands. The CL150 Cooling Distribution Unit ‘CDU’ has been designed to provide close control cooling to the rear coolers eliminating the potential of condensate.